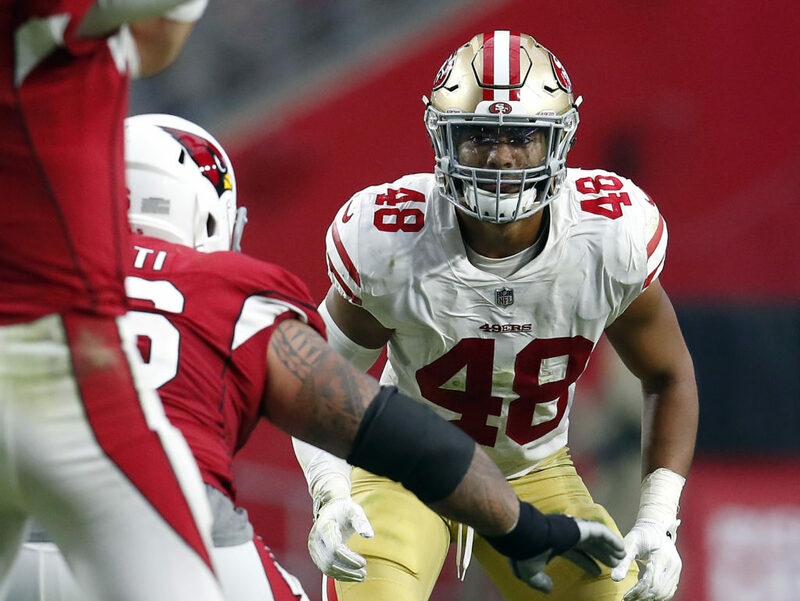 SANTA CLARA — To an observer, Fred Warner appears to sit in silence every afternoon while he faces his locker and wears tiny headphones and studies game film on an iPad. To Warner, the 49ers’ terrific rookie middle linebacker, he’s somewhere else. Not in the locker room. He’s in the iPad, standing on the virtual field, smelling the grass. Hearing the crowd. Doing his job. Identifying the opponent’s formations, then making the necessary calls and adjustments before each play. Warner does this all week. He lives in a simulated world. This is the life of an NFL middle linebacker. Warner is a success story on the Niners. Wish they had more players like Warner, and less like Foster. Which leads to my question, is everyone still high on Nick Bosa? I would rather take Quinnen Williams, who’s like the next Aaron Donald. I am not a huge fan of Bosa. He is presently recovering from surgery, so he has durability concerns, like Joey, his brother. I will expect Nick to hold out, like his brother, too. Granted, he has talent, but he might be another headache. I agree, QW seems to be a safe bet, but Clelin Ferrell may be another good choice. I am and I wouldn’t touch Williams, it would mean we drafted a DT with our first pick 4 years in a row and never addressed edge or corner. I expect the Raiders to get the first pick, so they can draft Bosa. Then the Niners can trade back, and/or select Clelln Ferrell. Bosa has a red flag with his surgery/quitting the team. Who do you have the 49ers beating? As to Bosa, I’m not in love with him… and would pray for a king’s ransom from some desperate qb needy team… However, I don’t see them getting that much this year… meaning the extra first would have to come next year, which is not ideal for this team. Denver, and/or the Rams second string. Let’s hope the Icarus fall is not destructive and allows them to lose some air while not falling into the sea. A birdsong shatters the still. See the madman in his gaze. Fly and touch the sun. In the name of God my father I fly. Now his wings turn to ashes to ashes his grave. Fly as high as the sun. Nevius article…. Good read–effective because it gets to the unpleasantness without a pile of steaming snark and clouds of buzzing flies. There’s also that incident where Ruben and Ray Ray were held at gunpoint while outside a night club. Next years draft will be crucial for the new regime. Lynch and Shanahan will need to do more with less (draft picks). Foster had many red flags before being drafted by Lynch and Shanahan. But like many of us felt at the time, the new regime thought that the risk of drafting arguably the best LB in college was worth taking a chance. Also, Reuben’ rookie year (aside from nagging injuries) showed promise for the future. I happen to believe that Lynch and Shanahan will grow from this and become stronger and wiser going forward. Btw, nice piece from Grant on Warner. Lynch did a very good job with this pick. He will need to further solidify the LBng area with FA and draft. Hoping that the third time (draft) is a charm. Some say it is all on the players. However, who chooses the players? Some say it is the lack of talent.However, when JG started, he made those talentless players beat 3 playoff teams. Sounds like the coaching is what held them back. The coaching did not prepare them fully. The coaching did not put them into positions to succeed. The coaching did not utilize the players correctly. There is a 10 point plan on how the Niners should draft. If they avoid the red flagged players, if they avoid the ACL players and if they avoid making the unforced errors, maybe the other 7 points will not be so critical for success. JL is a media guy. He should stop making those puff pieces. In retrospect, he just looks clueless. JL needs to accept a hard hitting interview, and accept all slings and arrows. He did acknowledge his failures on the Tolbert and Lund show, but they still wanted to crack jokes and keep it light. The only way how JL will impress me, is if he calls up Grant and does a real interview, with real questions. Until then, JL will continue to make me SMH, and wonder if he has the leadership skills needed to be GM of the San Francisco 49ers. The hotter the fire, the stronger the steel. KS needs to swallow his ego, and admit a 2-9 team needs help. He needs to sign an OC, or he will never learn how to finish games. A pick that no one had to warn us about. That’s progress! Does Warner have a brother? Two and they are in the movie business. And cranky! But no reason to cast him out of the family! Kind of depends what he does in the clutch whether he is a keeper or not. Nice article, Grant. More of these types of articles, please. Now that was a good informative article, one of Grant’s better ones in the recent past. Are some of the defensive woes due to Warner’s inexperience for making adjustments? This team is riddled with them last couple of years. I don’t want to use injuries as an excuse as all teams go through them. Whether we like it or not injuries play an important role in any team’s success or failure. Best thing to do about injuries is to prepare for them. Depth at key positions is key. This is why this offseason will be the most important for the Shanlynch regime. There will be no excuses for poor performance next year. Another Sunday….another stupid game…..Kyle please shock me and win a freaking game…. The 49ers are starting Mullens, their top two WRs are out, most of their starters are nursing injuries, and they are facing a Seahawks team who is clicking on all cylinders. Tom Holmoe’s comments remind me of the adage that coaches want players who have character, not players who are characters!!! Niners would win with a few more Warners on the roster. Maybe Lynch and KS will learn from their previous experiences of player selection in FA and in the draft. After all, repeating the same process but expecting different results is the definition of insanity and the sure recipe for disaster! It would appear that character tipped the scales in favor of Thomas. Looks like Lynch missed both in opposite directions. Because he was redundant, not really what they envisioned about him and then played out of position. Plus, Lynch liked him. I like a lot of people but wouldn’t necessarily hire them! Ya see, Coach can write a nice article when he doesn’t interject his rampant animosity towards the team into his writing. Well done Coach. Warner was a great pick. They need to pair him with a dominant pass rusher, something the team hasn’t has for eons. The two most important positions in todays pass happy NFL (with the exception of todays opponent and a couple of others because they still run first) is number one, QUARTERBACK, number two, DOMINANT PASS RUSHER! A game changer. They have one game changer in Jimmy G. They need one on defense. They can’t mess this up. The 2019 draft is oozing with dominant pass rushers. If they have the number one pick, it’s a no brainer. Nick Bosa. Take the guy!!!!! If they have 2 or 3, then maybe think about trading back to mid 1 and look at Zach Allen, Rashan Gary, Clelin Ferrell, or Montez Sweat. Maybe if they trade back pick two outside pass rushers. Look at Walter Footballs, and other outlets top 10. There’s plenty to go around. They can’t mess this up. Yes they need a corner or two. They need a dominant WR. They need a bigger, stronger running back, an OT to replace an aging Staley, and probably a safety. However, it all starts up front. When will they get this? Hopefully this coming draft. It would be nice to see them get over the Seattle hump but come on. Not today. They are limping in to town with a team of second and third stringers. They couldn’t beat this team up there when fully loaded. Just hope that they continue to play hard, which Kyle has continued to have his team do. There is no quitting. There’s no giving up on this team. They are just overmatched with the current roster. I’m just hoping for a competitive performance. No field goals. They have nothing to lose. Go for touchdowns. Have a great day folks! Go Niners!! Trade back? Do not settle for field goals? Go bold and go for TDs? I’ve heard quarterbacks talk about the peak productivity window. It starts when they’ve mastered the game mentally, but before their physical skills declined. They said window can be painfully short. Sometimes only a few years. Often a players biggest regret is not dedicating themselves to film study earlier. Barring injury Fred Warner should have a wide window. More like a custom sliding glass door 20 feet long. Walsh believed it takes 5 years before a player has the schematic knowledge to reach their full potential. Yes. Say a player was drafted at age 22. His mental peak starts at 27. His physical peak begins to decline at about 31 (give or take a few years depending on position, genetics and other variables). But study like a maniac the first few years and the window widens dramatically. This is why I’m hopeful Solomon Thomas will improve next year. Glad they gave him so many snaps last game. If they let ST rush the QB, maybe he can get some sacks. Lol Seb! I’m just a fan like you who has witnessed hundreds of Forty Niner games dating back to my first game at Kezar with my dad vs the Green Bay Packers with Bart Starr! I believe they lost that game! I want to say it was approximately ‘64-‘66? That was followed with almost 40 years of season tix up until they moved to the mausoleum! But the one key ingredient in most of the Super Bowl winning teams was a dominant pass rusher, especially ‘81 through ‘89. The ‘94 and ‘12 teams relied more on exotic blitzing than having a pure dominant outside pass rusher. IMHO, that’s what they need now. An outside guy that can wreak havoc every down. If trading back gets them that guy, and more, than go for it! But don’t mess up!! I don’t put such a dramatic negative spin on the previous drafts that Coach does, but there’s definitely room for major improvement! Where is the next Fred Dean? Fred Warner is a Good MLB. Taking on all these responsibilities as a rookie will just jump start his career. Already proven to be a good tackler, working on his coverage skills should continue to propel his game. Good 3rd round pick. Hopefully the next Brian Urlacher. Grant, I was just looking at you’re popular tags are the bottom of my mobile page. All those guys are no longer on the team. Does that actually update, or is there really no popular player or coach on the current team being talked about enough? Dont get cute Bosa is the pick! We read articles lately how the Mcglinchy pick helped put our OLine into the top 10. Bosa will do the same for the DLine. Why is it so important to win some of these last games? Losing just drives away decent free agents. Winning those last 5 games last season gave me hope. JL was able to attract decent FAs, because of that 5 game winning streak. Even if they lose, there is no guarantee that having the top pick will create a winning culture. Look at Cleveland. Sure, they are doing OK now, but 2 winless seasons are hard to stomach. Winning will also give the fans something to cheer about. That empty mausoleum is depressing. Winning will give the players hope, too. Instead of being yelled at, the players will buy into a scheme if they see positive results. Foster shined on the FO and coaches, and did not help them win. Finally, since Jed wants to lose, because he wants to be rewarded for losing, I want the Niners to win, just to make him mad. We regret to inform you that your STATUS has remained in the category of a zero! Please learn to write English properly. Please give up. Trying is futile for you. Prime, we know your status is zero, you do not need to crow about that. Please do not keep obsessing about status, it makes you look desperate. Just wondering who is keeping track of status elevations? Prime, now you have done 3 posts about status. Obsessing about status means you are very insecure. Sounding desperate is not impressing me. If you want to elevate your status, write something coherent and interesting. Hurling screeds and snark just defines you. Is there a committee that looks at all the posts and they meet and then vote? Then they say whose status is up or down? Prime, you yearn to join some committee? Desperation. You keep lowering your status by leading with your chin. Prime, your 4 posts obsessing about status is worse than desperation. It is pathetic. Is there a barometer reading to determine whose STATUS is up or down for the day? Prime, with 5 posts about status, is now the village idiot. Does 6 posts elevate my STATUS or no? Prime, keep obsessing. Now, I pity you. Will the blog call an emergency meeting to determine if your STATUS is up for promotion? 7 times. Now you sound like a broken record. This could be the day you break through your current STATUS and get elevated. Zach Cunningham recorded a pick-six today. Who around here said he would be better than Reuben Foster? I mocked Zach Cunningham many times, but avoided Foster due to all of his red flags. However, I did see you mention Zach Cunningham in your draft posts. Before we start congratulating ourselves too much though, its not as if he has been great this year. He’s been ok. Better than Foster. So have most LBs in the NFL this year. He’s getting better and has played stellar football the past couple months. He’s been ok this season. “Stellar” is a bit over the top as to how he has played the past couple of months. Especially given he missed two games recently. He has been getting better as the season has progressed through. Regardless, he was the LB the 49ers should have drafted last year. That’s what it takes to get your status elevated. A little self promotion to let everyone know it was you! Even when it wasn’t, hey Prime? No mention of names but some people need to be recognized. Otherwise they make it known for self gratification. You got lucky. Lucky that Foster’s surgery didn’t take. Lucky that Foster is an idiot. Luck is when preparation meets opportunity. Grant did his homework. Zach Cunningham just took advantage of his opportunity. Foster is unlucky. He squandered his opportunity, when he easily could have avoided any pitfall. Grant and I had a long discussion WRT Foster or Cunningham. This was before the botched surgery report and the Combine incident. We liked both prospects. Remember when Grant mocked Foster to us? Cunningham is good, but I’m happy with Warner now. No, I saw Foster for what he is. How can the Niners win? By running the ball. Of course, the Seahawks will stack the box to stop the run and dare the Niners to pass. Niners need to shape them by spreading them out, then attack the edges. The Niners should take advantage of the Seahawk defensive speed by doing counter, misdirections and reverses. Mullens cannot be sacked if they run the ball. Both Juice and Breida need to get the ball in space, so they can choose the weakness in the line. If the Niners run the ball more than they pass, they have a chance to win. Jack is not impressed with this article. :D.
To be fair though, I think he will be a very good MLB, for years to come but not great. That’s ok though, because those players are needed. Grant still thinks JL should be fired, but thinks Jed will not do it because Jed will become even more humiliated. Now, he thinks Polian should be the Niner Vice President to help JL. However, he did mention Mike Holmgren. he dissed MH because of his Cleveland experience, but nobody has succeeded in Cleveland. I think Holmgren would be a great candidate for Niner Vice President. He would be another connection to Bill Walsh. He used to coach the Niners, and knows the WCO like the back of his hand. Heck, he can help JL as VP, and make him OC to help KS. Hey Seb, just keeping it real. Though you might have mocked Cunningham many times, that actually means nothing if you don’t pick him in your final mock, the only one that really matters, as it would be the players you were actually drafting as a GM, right? Scanning through the final mocks of many, including my own, I didn’t see his name anywhere. Mock 6.0-Final mock, 1 day before draft. Niners trade back with Pats. Payback to BB for the JG gift. Patriots will leapfrog over Miami, Buffalo, Cards, Ravens, Chargers, Bengals, Saints, and Steelers, all teams with QB needs. Pats need upgrade over Hoyer, who is not in their future plans . Or, Pats could replace Solder with McGlinchey. Niners trade pick number 9 for the Patriot pick numbers 23, 43, and 95. Niners then trade up with Detroit. Niners trade pick numbers 95, 184 and 223 for Detroit’s pick number 82. Detroit moves back for more picks. Niners end up with pick numbers 23, 43, 59. 70, 74, 82, 128, 143 and 240. Juan, if the Niners had followed my mock, they would be better off, because they would have a pass rusher. Harold Landry has 2.5 sacks. Carlton Davis has started every game. James Daniels has played in every game, and has started 5 games. Royce Freeman has 84 rushes for 349 yards, for a 4.2 yard average, with 5 TDs. DJ Chark has 14 receptions for 174 yards for a 12.4 yard average. Instead of Schultz, I thought I mocked Jonnu Smith, who has 36 for 386 yards, for a 10.7 average, and 5 TDs. Actually, I think I went with the CBS Big Board, and got DJ Jones as my one hit. I did 2 final mocks, but had to choose one of them. My bad, I think I was talking about the 2017 draft, when talking about DJ Jones.